Since the closure of the nursing home in 2004, the Hall has been advertised for sale with an asking price of £1.3 million. 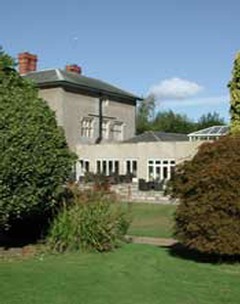 Following the sale in 2005 of this former nursing home to the Bellamy family, the new owners planned to turn the Hall into a restaurant with head chef Des Sweeney. Under the Bellamys the Hall will not only become a restaurant but also a training centre for chefs. The expected date of opening is late autumn 2005. The planned opening of the restaurant took place but the tenure of the Bellamys only lasted until 2008. Above Left: The Hall Restaurant in 2004/05 with function room on the right. Above right: The Hall Restaurant in 2008/09 with the new Orangery shown on the right. 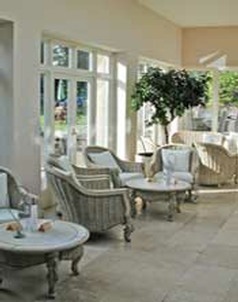 In 2008/09 a delightful new orangery is the latest of several improvements made to Woodborough Hall as new owners, Timothy Lock and his wife Betina, establish the venue as the finest in Nottinghamshire and the East Midlands. The Orangery adjoins the Grade II listed building and is designed to compliment the main hall and gardens and provide an additional area for guests to relax either before meals or after or to enjoy a quiet coffee. With French windows opening out onto a terrace in the garden, the bright and airy room boasts under-surface heated Jerusalem stone flooring, high quality, hand-made rattan furniture from the Far East and a hand-carved feature mirror which dominates one wall of the room. The facility also benefits from superb theatrical lighting which provides special effects for the evenings and a hand-carved birdcage centrepiece, designed and commissioned by the owner and, of course, potted orange trees from which Woodborough Hall hopes to produce its own marmalade in the near future. There can be few more idyllic and historic venues to dine than Woodborough Hall. The Bank Hill site in the village where the Hall is located was once home to a Saxon fort and the present building dates back to 1660 when one Philip Lacock bought the Manor from the Strelley family. In spite of a less auspicious recent history, the last four years has seen a dramatic reverse of its decline as it has been fittingly and lovingly returned to its former splendour. The current owner has spent a career in sourcing, equipping and managing similar venues for other people and now sees Woodborough Hall as the perfect opportunity to put the best of all he has experienced into a project of his own. In addition to the Orangery – plans for which were already in place when Mr Lock took over the venue – there are a number of other changes which have been made. These include new seating in the reception area, new fireguards and a series of specially commissioned hand-carved feature mirrors which have a dramatic presence in most of the rooms. All improvements are designed to further recreate the period look, feel and general ambience of the hall. Woodborough Hall guests can now enjoy superb overnight accommodation. Bedrooms, inclusive of breakfast, are available for midweek and weekend bookings. The exterior and interior of the Orangery in 2008/09. Already a popular wedding venue – it is licensed for ceremonies – Woodborough Hall provides a perfect backcloth for all occasions: from a place to simply drop-in and enjoy a coffee and a cake, to something a little more substantial yet still fairly informal in the Brasserie where meals or sandwiches are served. Finally, for that special evening out, there's the Fine Dining restaurant where you can enjoy the very best of food and wine chef Des Sweeney and his team can prepare.